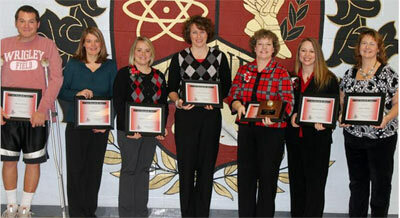 Central School fourth-grade teacher Ellen Gott was honored as the 2010 Chillicothe R-2 Teacher of the Year during an awards ceremony Friday afternoon, December 10, 2010 in the Chillicothe High School commons area. 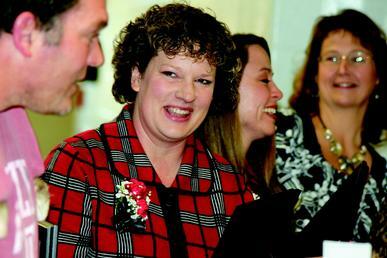 CAPTION: Ellen Gott is all smiles after receiving the 2010 Chillicothe R-2 Teacher of the Year Award. As the 2010 Teacher of the Year, Gott wins $1,500 cash and $1,000 for education items to be used within the classroom - prizes financed by the Chillicothe Education Foundation. "The skills we are teaching are too important for a single student not to learn," Gott stated in her application for teacher of the year. She believes in a professional learning community based on an environment where students are tested, grouped according to needs, retaught, reevaluated, and regrouped. "You have to be more than just a teacher," says student Caitlyn Cothern in a letter about Gott for the award. "You have to have a loving heart. Mrs. Gott is more than that." 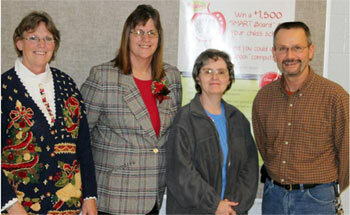 Nominees for 2010 Chillicothe R-2 Teacher of the Year (l-r): David Kinen, representing Dewey School; Kim Griffin, representing Garrison School, the district's Behavioral Management Program and the Chillicothe Alternative Center for Education; Hillary Beemer, representing Field School; Nancy Burtch, of Grand River Technical School; Ellen Gott (winner), from Central Elementary School; Marcia Bland, of the middle school; and Annie Shipp, representing the high school. Other teachers nominated for the award were: Kim Griffin, representing Garrison School, the district's Behavioral Management Program and the Chillicothe Alternative Center for Education; David Kinen, representing Dewey School; Hillary Beemer, representing Field School; Marcia Bland, of the middle school; Annie Shipp, representing the high school; and Nancy Burtch, of Grand River Technical School. Those teachers received $1,000 each to use for classroom materials and $500 each in a cash stipend - also from the Chillicothe Education Foundation. Several members of the district's support staff were also honored during the presentation, including Rick McCully, a custodian at Dewey School who was named the 2010 Beacon Award winner and received $300 from the Chillicothe Education Foundation. 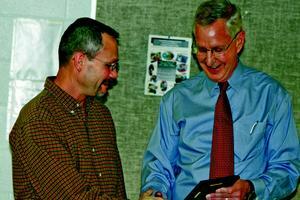 Rick McCully is presented the 2010 Beacon Award by Ed Douglas. Nominated for the 2010 Chillicothe R-2 Beacon Award (l-r): Doe Sperry, representing Garrison, the district's Behavioral Management Program and the Chillicothe Alternative Center of Education; Beverly Meyers, of the middle school; Cheryl Wood, from Field School; and Rick McCully (winner), of Dewey Elementary School. Not pictured are Lisa Wilson, of the high school; Candy Pepper, from Central School; and Lisa Bevelle, of Grand River Technical School. Other support staff nominated for the award were: Doe Sperry, representing Garrison, the district's Behavioral Management Program and the Chillicothe Alternative Center of Education; Cheryl Wood, from Field School; Candy Pepper, from Central School; Beverly Meyers, representing the middle school; Lisa Wilson, of the high school; and Lisa Bevelle, of Grand River Technical School. Each nominee received $100 from the foundation. Ed Douglas, chairman of the Chillicothe Education Foundation, presented the awards to the recipients and told those gathered that the foundation is proud to sponsor the district's Teacher of the Year and Beacon Awards programs because they encourage excellence within the Chillicothe R-2 school system. "The mission of the Chillicothe Education Foundation is to support local education in a way that the district would otherwise be unable to do," he said. Through the program this year, Douglas said, the foundation was awarding $12,400 to local teachers and support staff as a reward for their outstanding service to the district and its students. The Chillicothe Education Foundation board is comprised of Inger Young, Brenda Fellhoelter, Julie McCoy, Bruce Brodmerkle, Mary Staton, Mike Turner, Ed Milbank, Lindy Chapman, Ron Wolf, Roger Wolf, Linda Gray Smith, and Ed Douglas. Chillicothe R-2 Superintendent Dr. Linda Gray Smith says that the district is grateful for the Education Foundation's support. She added that the district is comprised of many outstanding teachers, administrators, and staff members, whose dedication and efforts have yielded countless benefits to the district's students and the community. A reception honoring the teachers was held Wednesday, February 2, 2011, from 5:30-8:00 p.m. at the home of Ed Milbank, Chillicothe, Missouri. 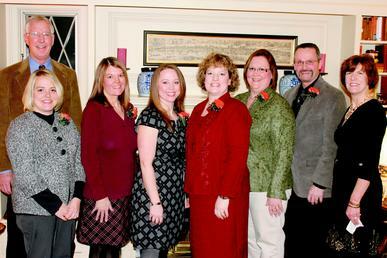 Ed Douglas (back left) announced the candidates and winners of the 2010 Chillicothe Teacher of the Year and Beacon Awards Wednesday night, February 2, 2011, during the Chillicothe Education Foundation fundraiser reception at the home of Ed Milbank. 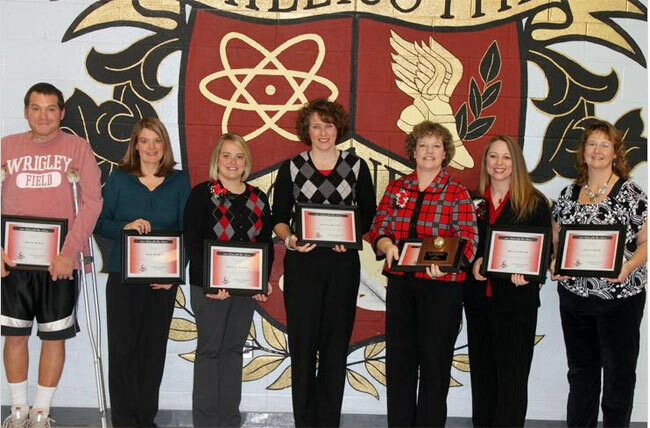 From left: Hillary Beemer, Kim Griffin, Marcia Bland, Ellen Gott (Teacher of the Year Winner), Lisa Wilson, Rick McCully (Beacon Winner), and Chillicothe Superintendent Dr. Linda Gray Smith. 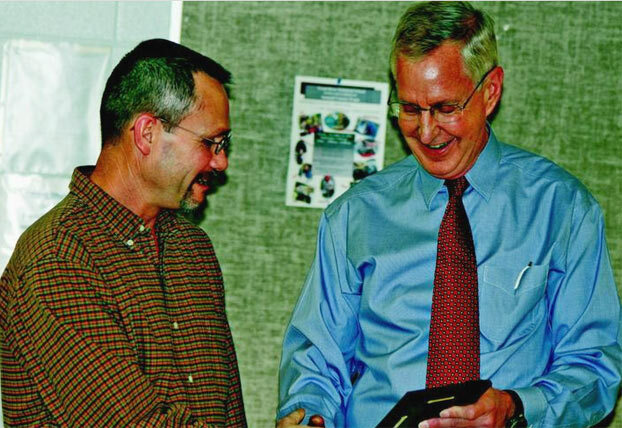 Also during the presentation held December 10, 2010, Smith presented several staff members with pins for their years of service to the district. Those receiving pins were: Jill Allen, Hillary Beemer, Marcia Bland, Julie Chastain, Robyn Garrison, Diana Holcer, Helen Jeffries, Karen Jones, Kari Keller, Penny Kennebeck, Natalie Leamer, Cody McCollum, Beverly Meyer, Kathy Midgett, Rachel Moore, Keri Rodenberg, Billie Smith, Sondra Sturguess, and Anita Tatum for five years; Lee Caughron, Susan Elson, Katherine Gibson, Judy Holcer, Karen Jackson, Becky Lewis, Mike Lewis, Cyndy Munday, and Tara O'Dell for 10 years of service; Lori Beier, Kristy Clampitt, John DeBey, Don Dennis, Melissa Englert, Donna Ewing, Rick Gibson, Shelley Hayen, Marcella Murray, Kristi Newlin, Tammy Price, Bill Shaffer, and Shanda Wagers for 15 years; Lynn Allnutt, Debra Brick, Cheryl Gifford, Beth Milanovich, and Mary Pat Whiteside, 20 years; Peggy Bacon, Brenda Block, and Connie Souders for 25 years; and Susan Norris and Mary Lou Wilhoit, 30 years of service.